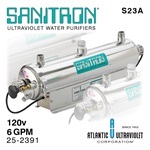 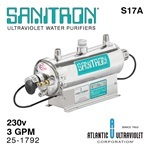 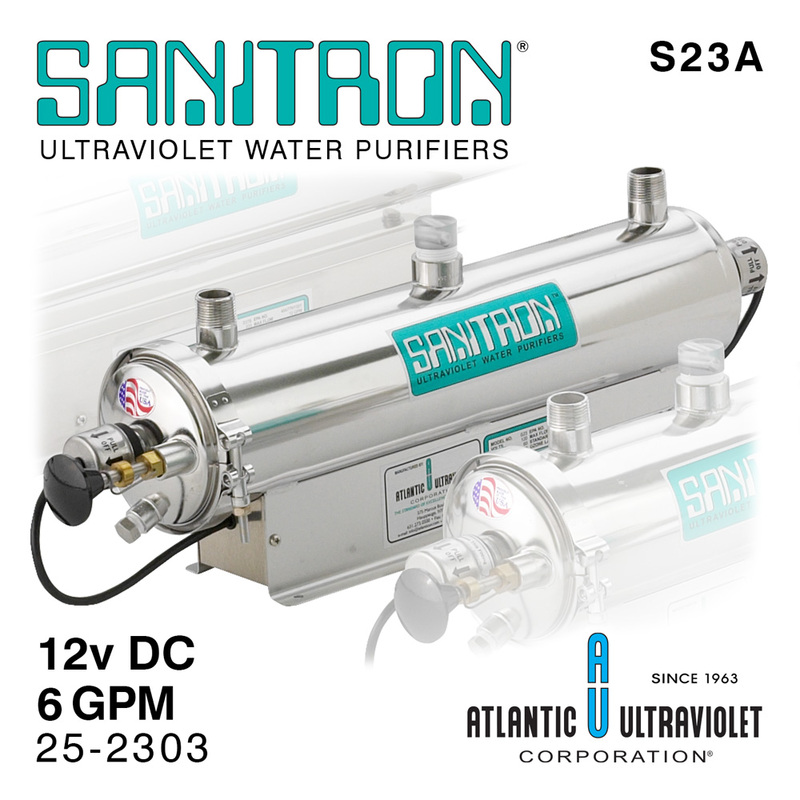 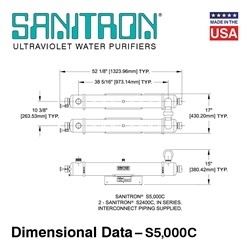 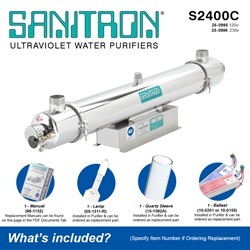 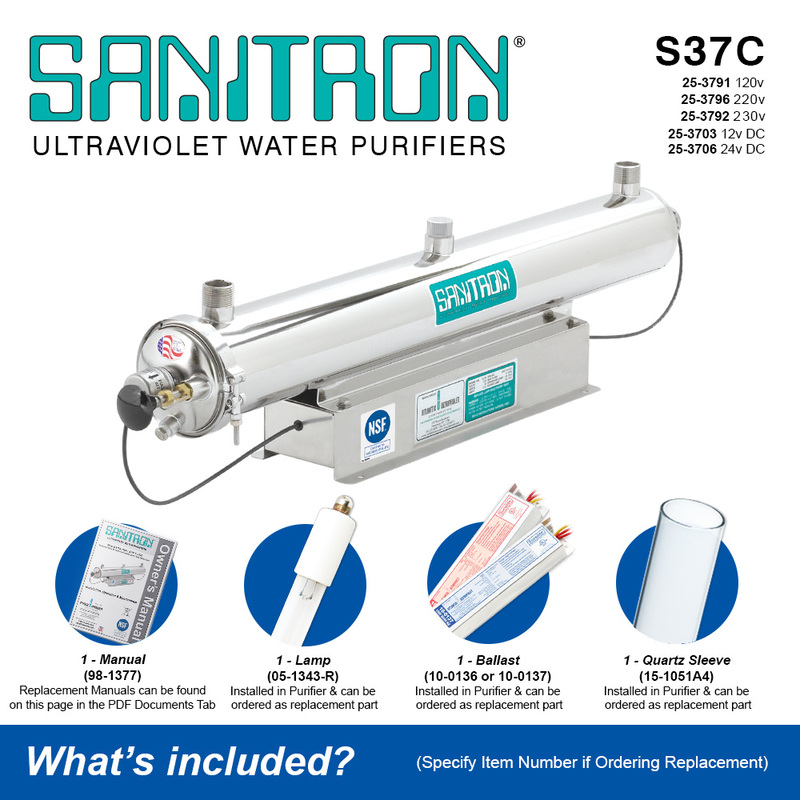 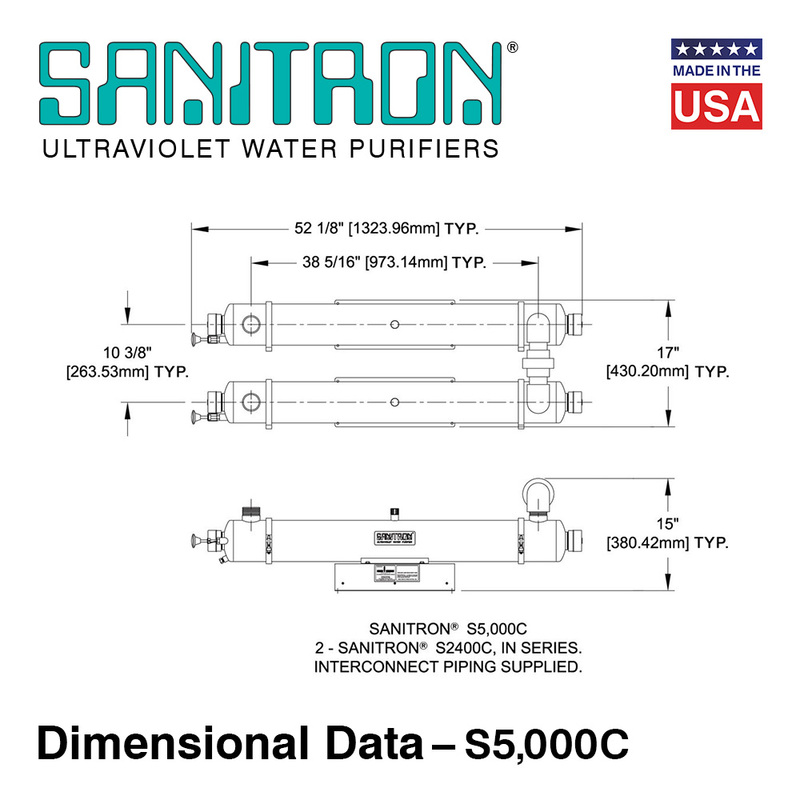 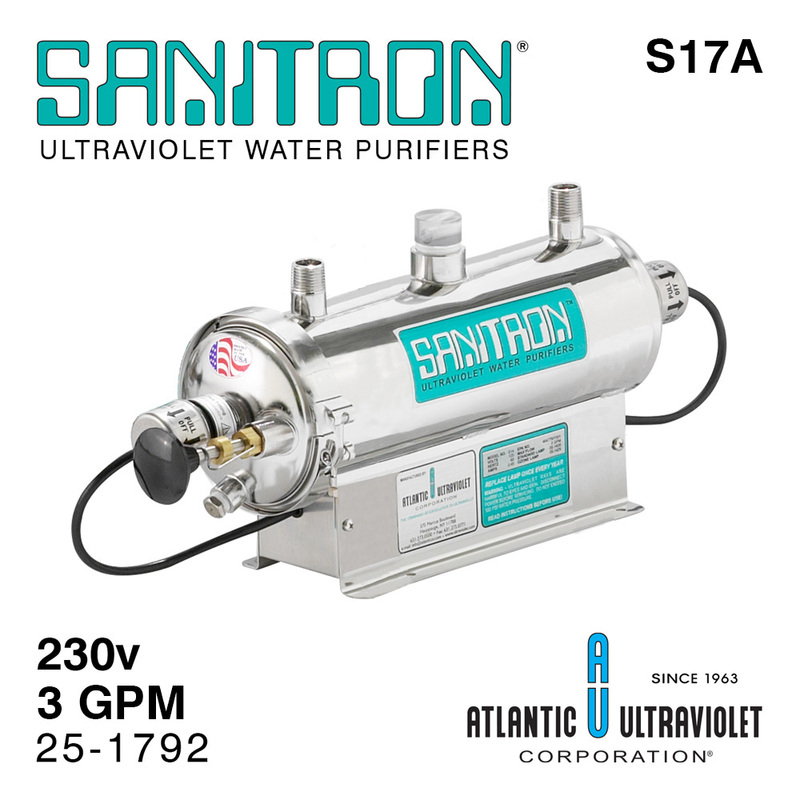 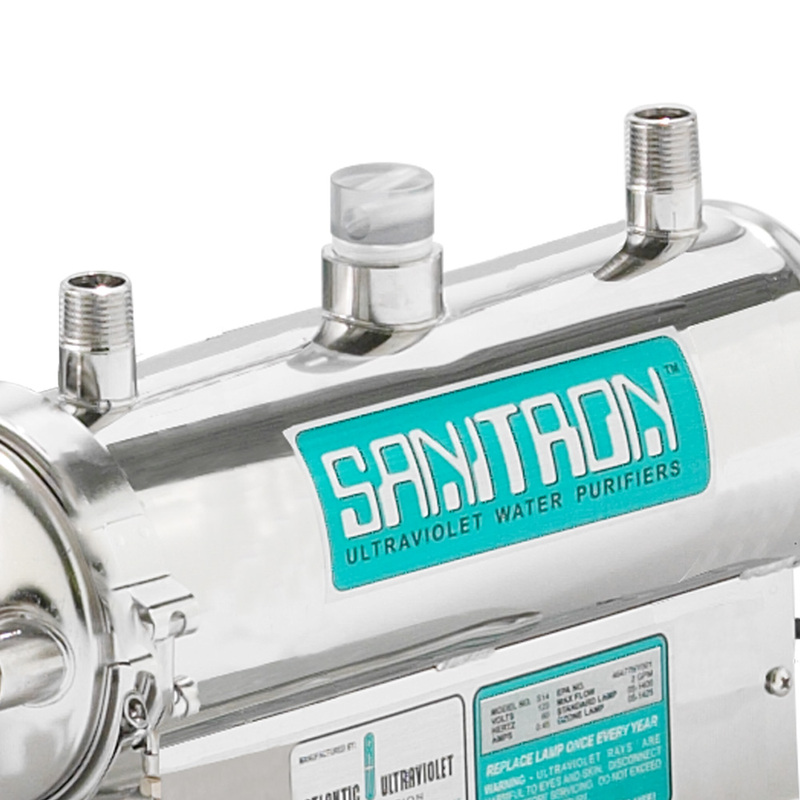 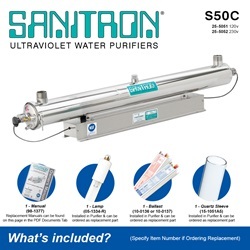 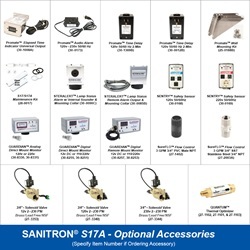 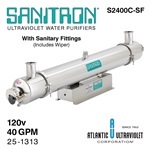 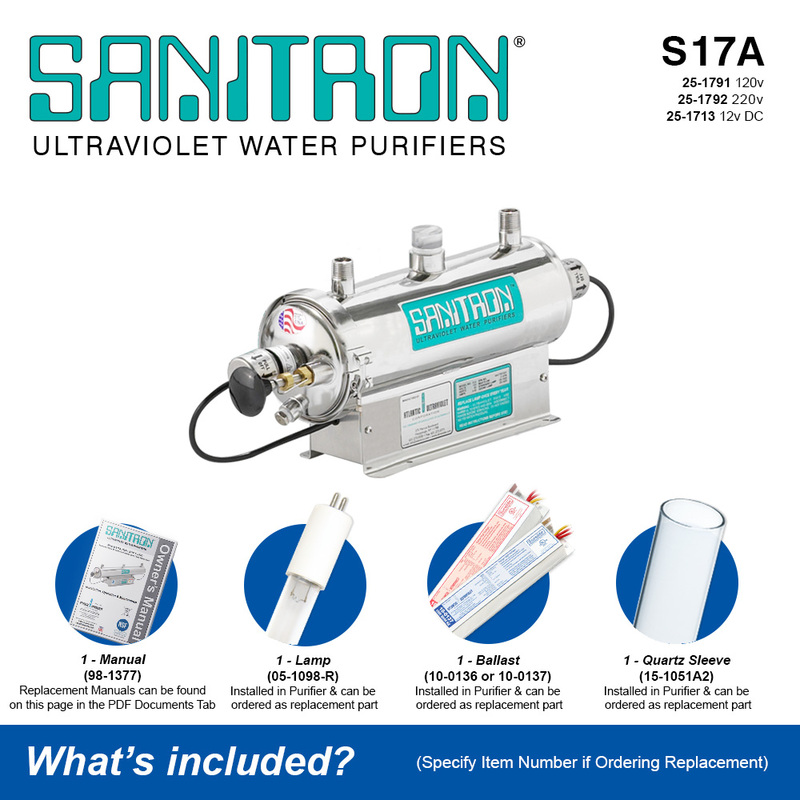 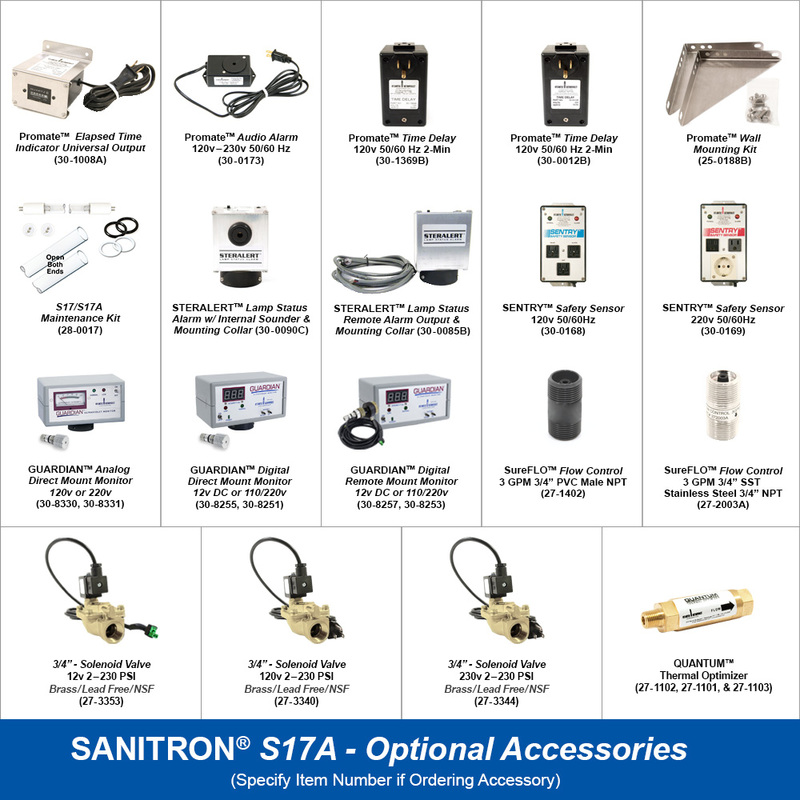 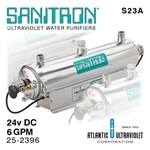 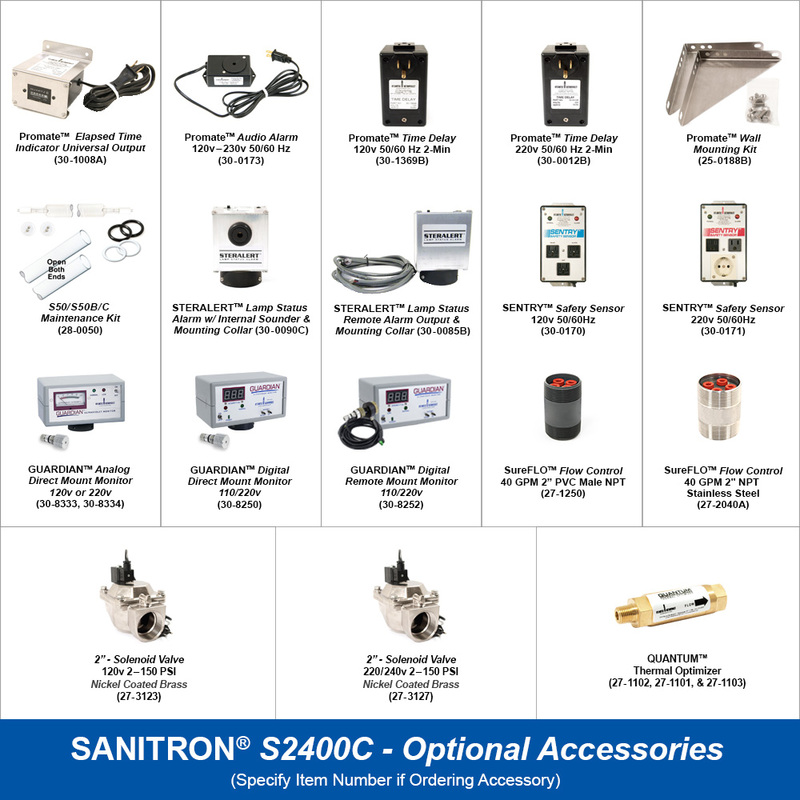 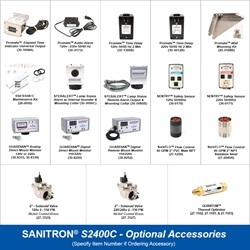 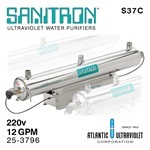 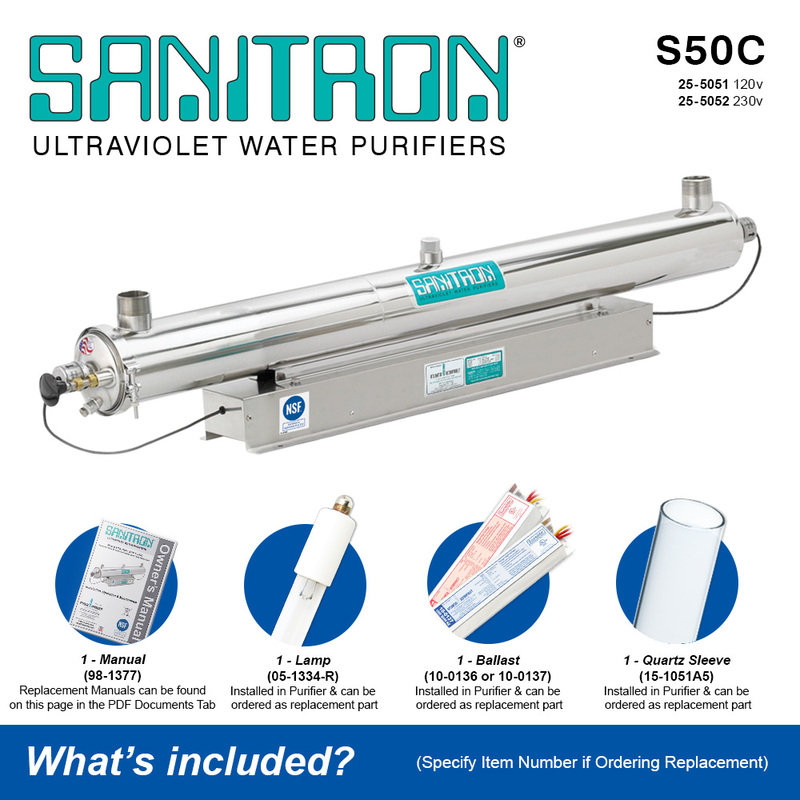 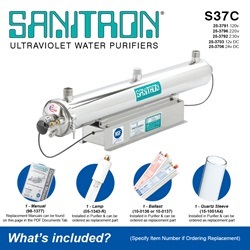 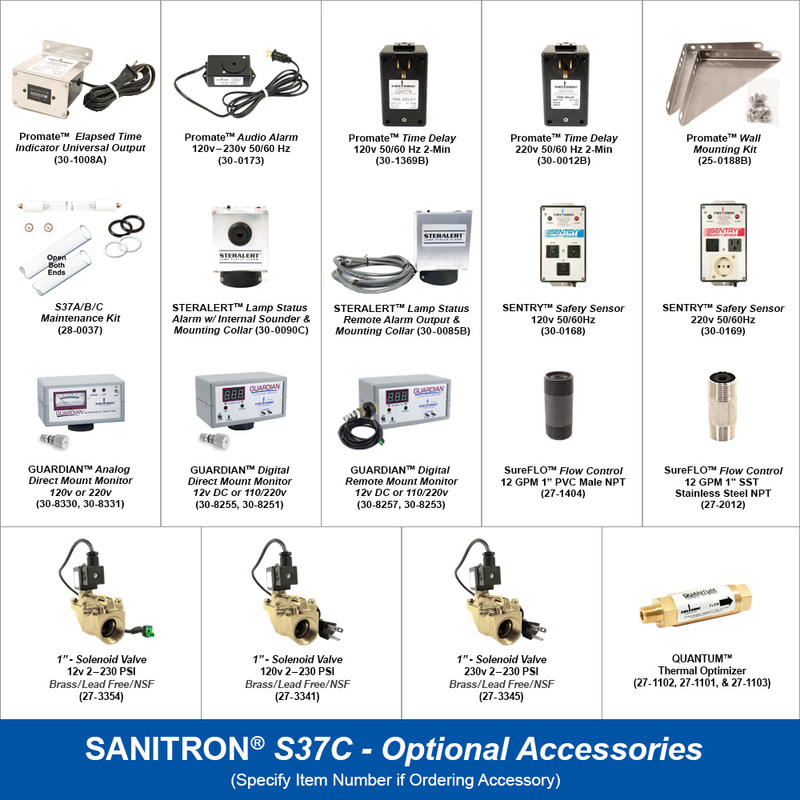 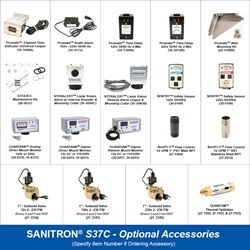 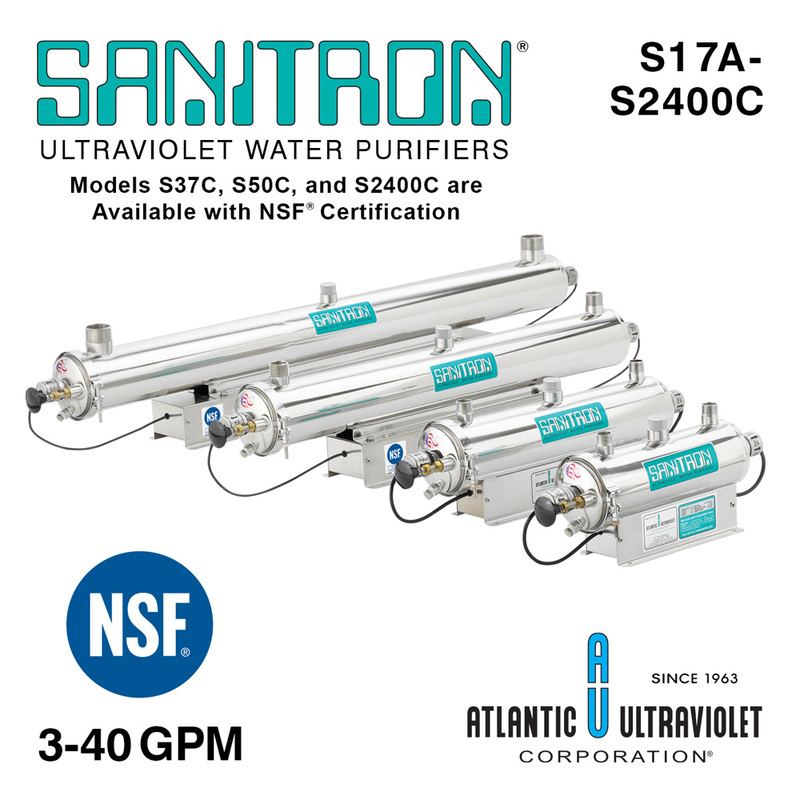 The SANITRON® series of units are of exceptional value. 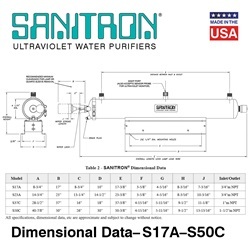 Units were designed to conform to U.S. Public Health Guidelines “Criteria for the Acceptability of an Ultraviolet Unit”. 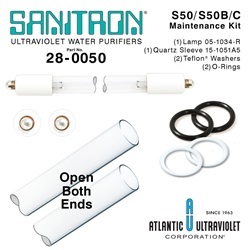 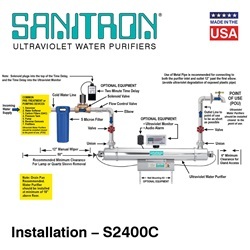 Each unit is well-featured and can utilize a number of different optional accessories such as an Ultraviolet Monitor or similar device for a more in-depth knowledge of the operation of the water purifier. 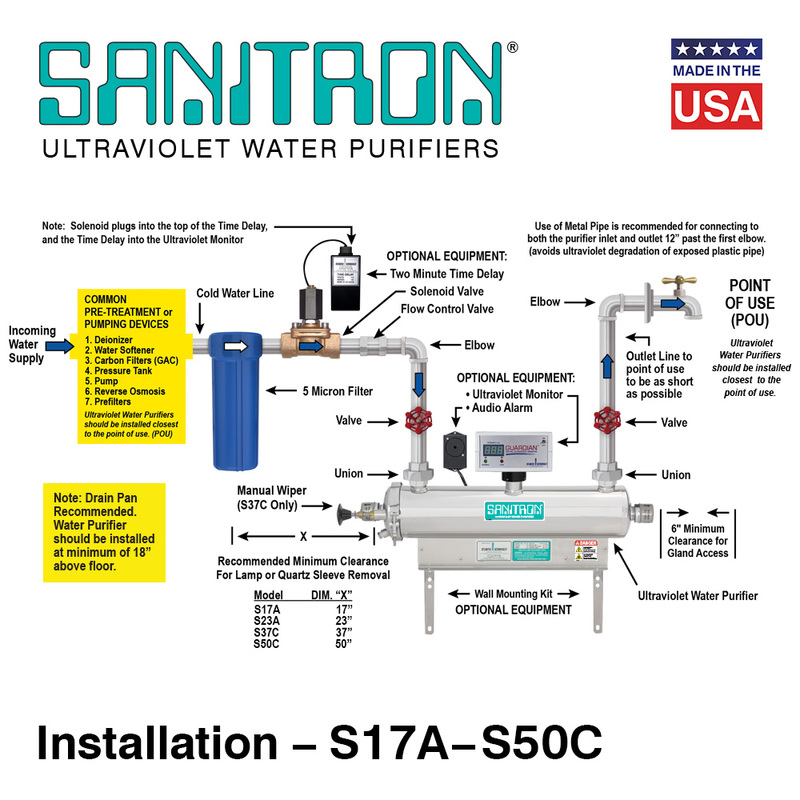 Applications include process facilities, home water wells, restaurants, schools, mobile homes, swimming pools, fish ponds, hospitals, laboratories, resorts, hotels, medical facilities, etc. Model S2400C is available with alternate inlet/outlet fittings. 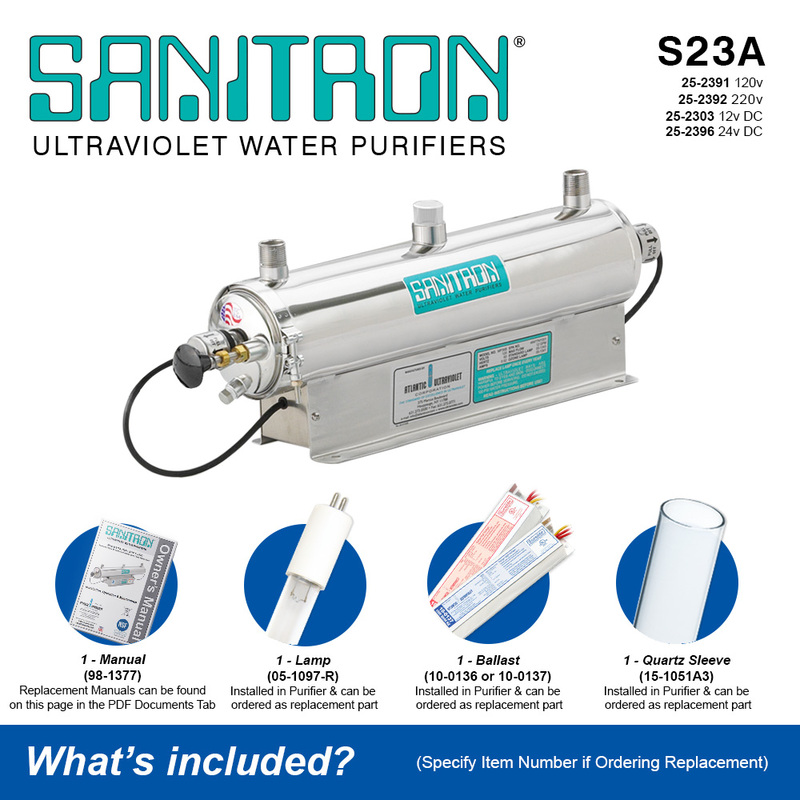 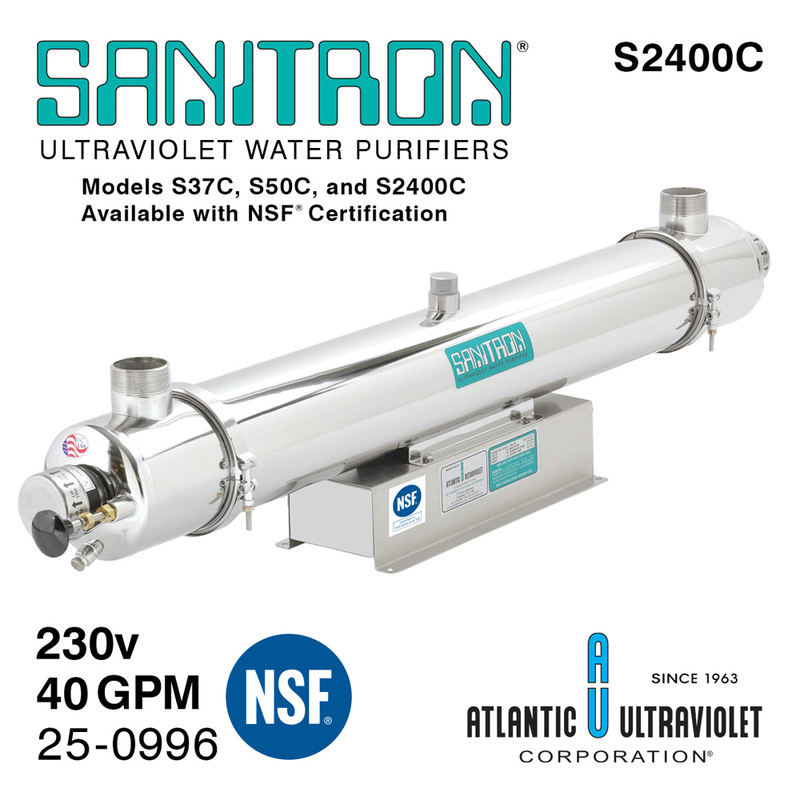 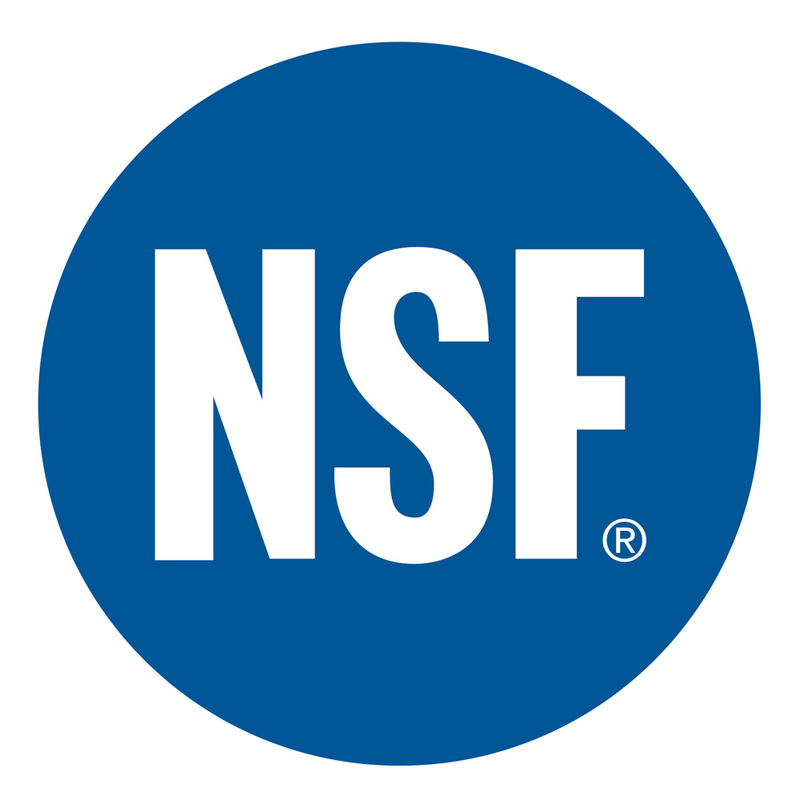 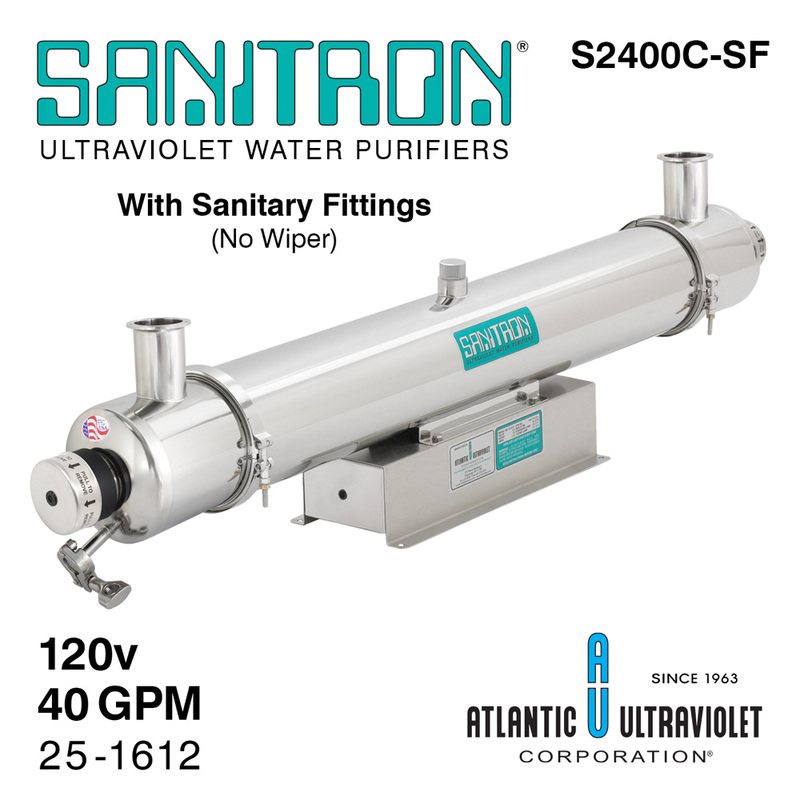 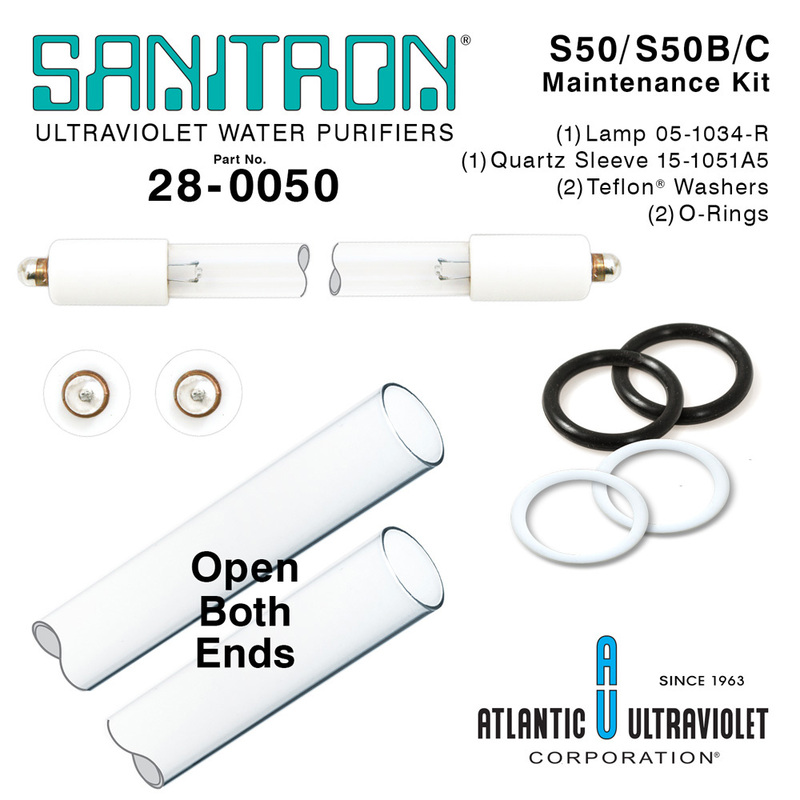 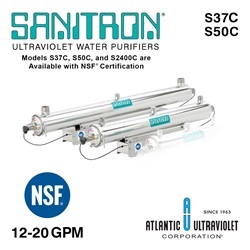 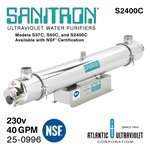 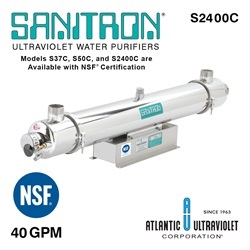 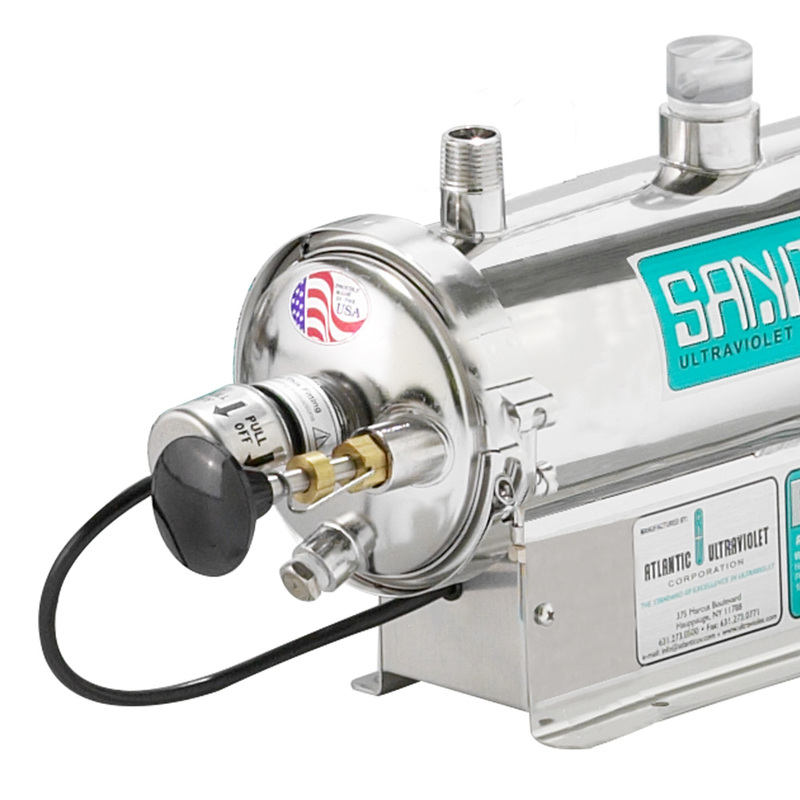 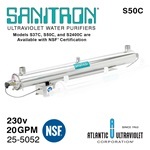 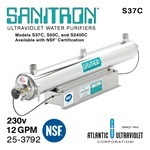 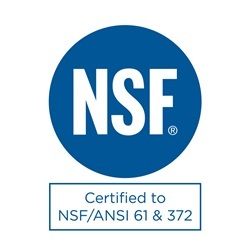 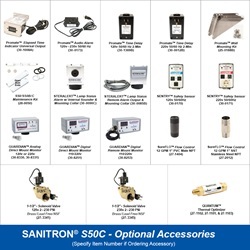 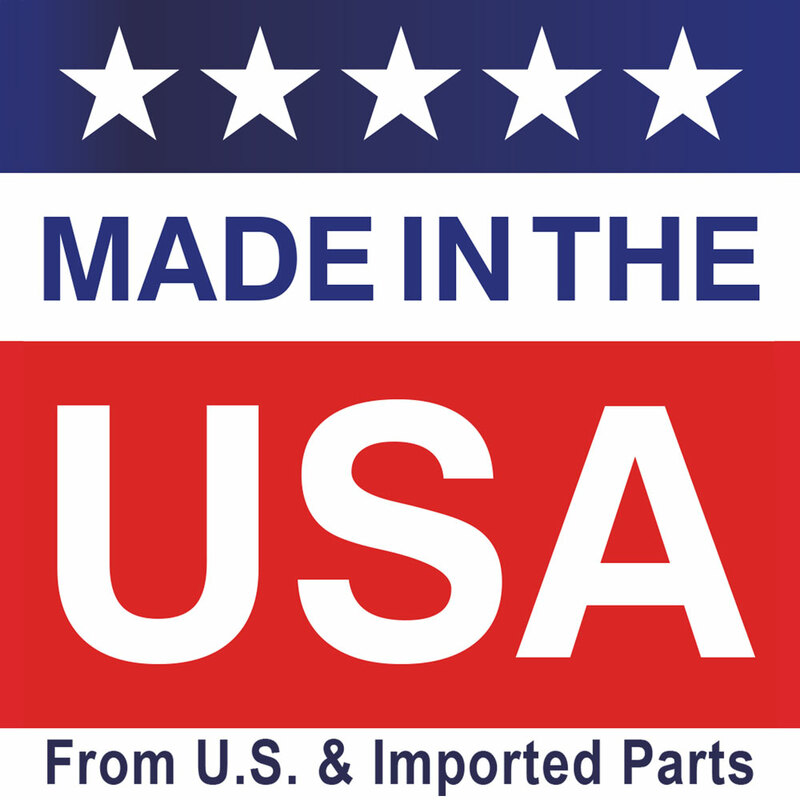 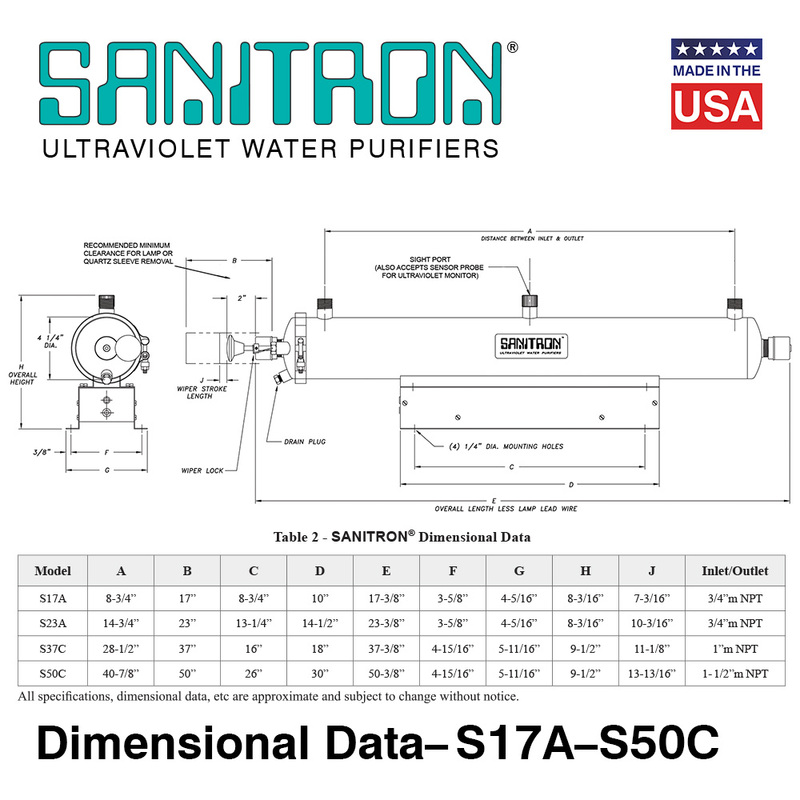 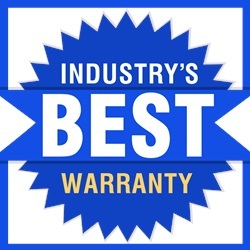 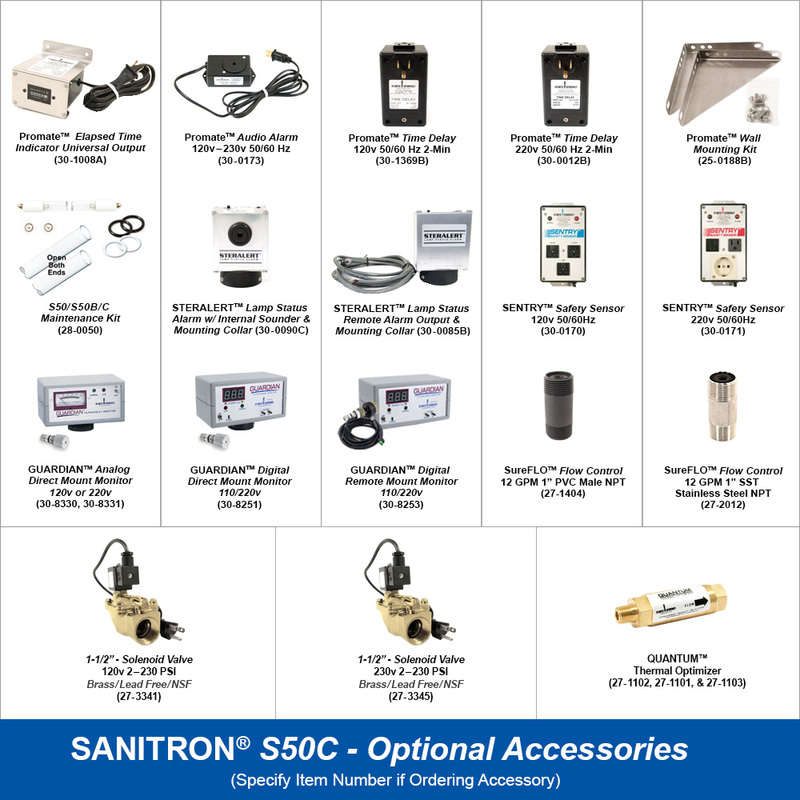 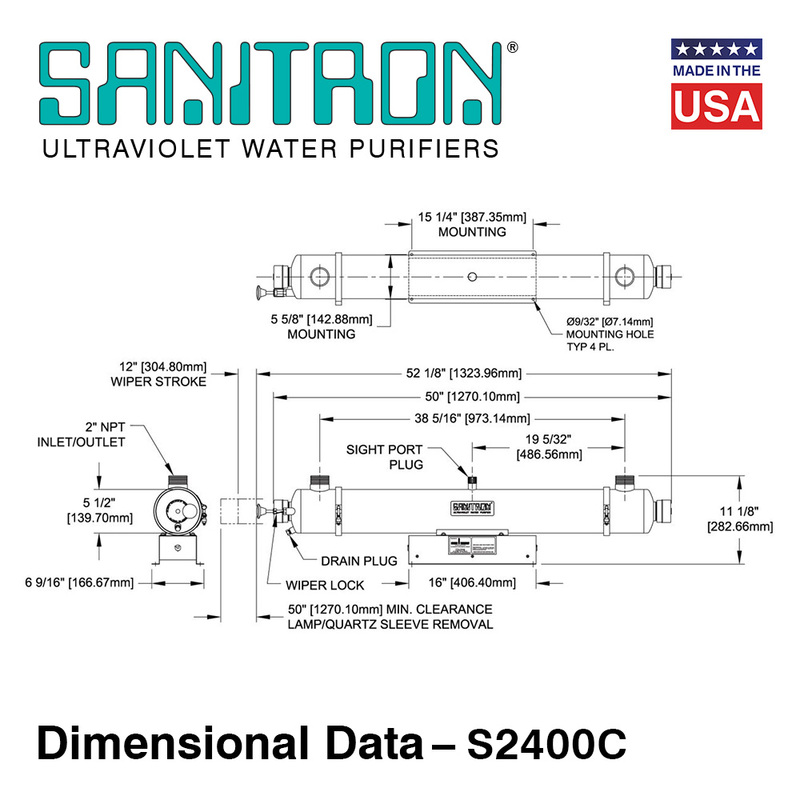 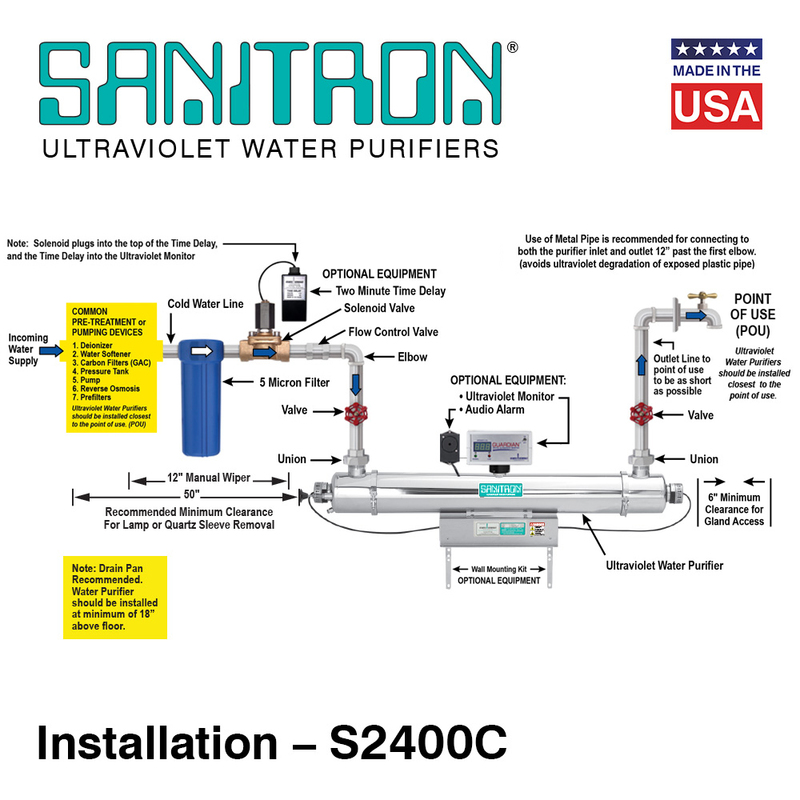 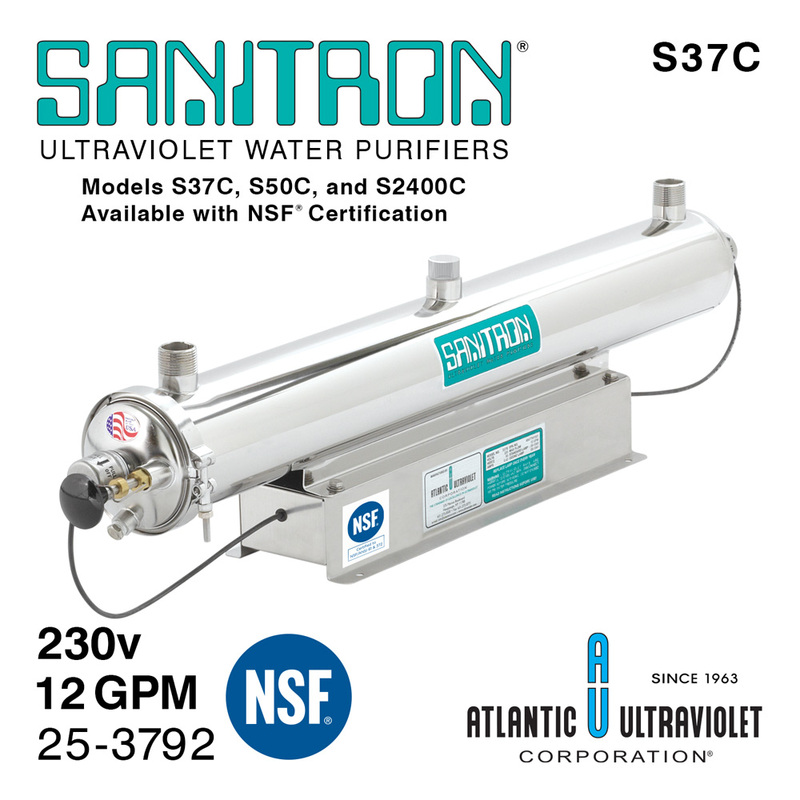 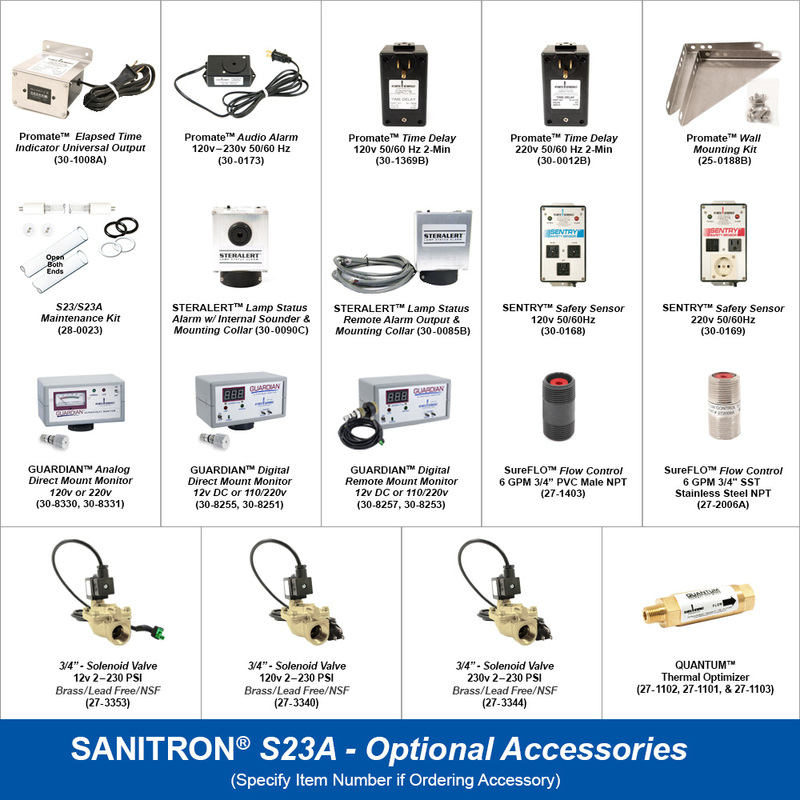 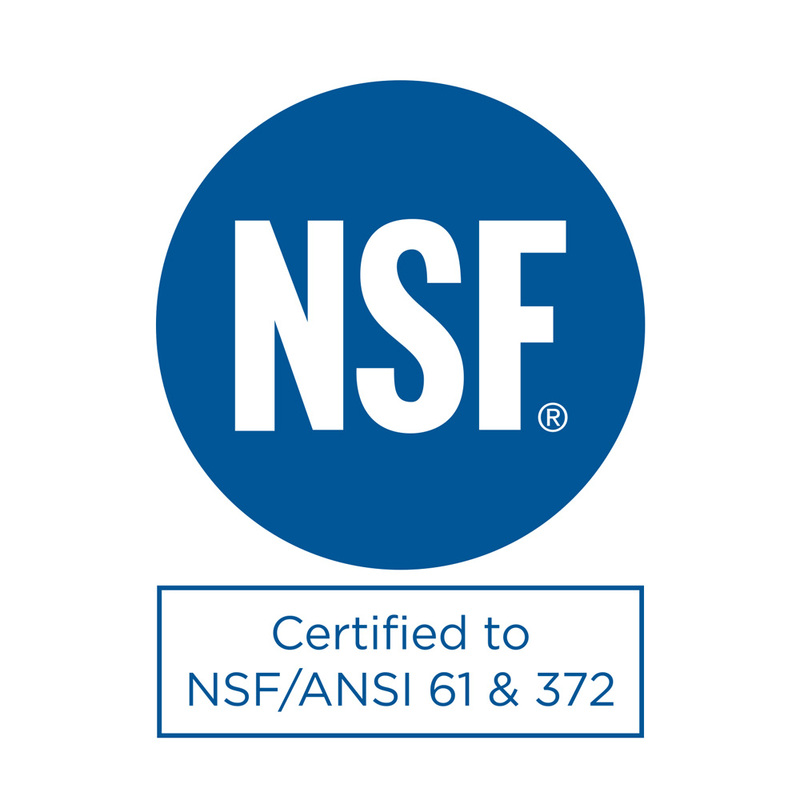 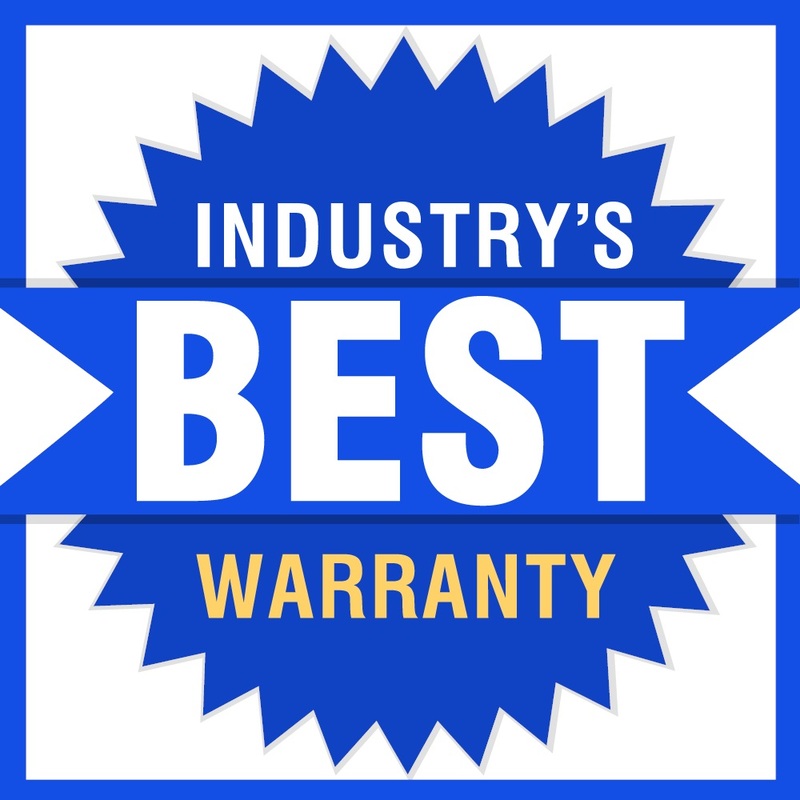 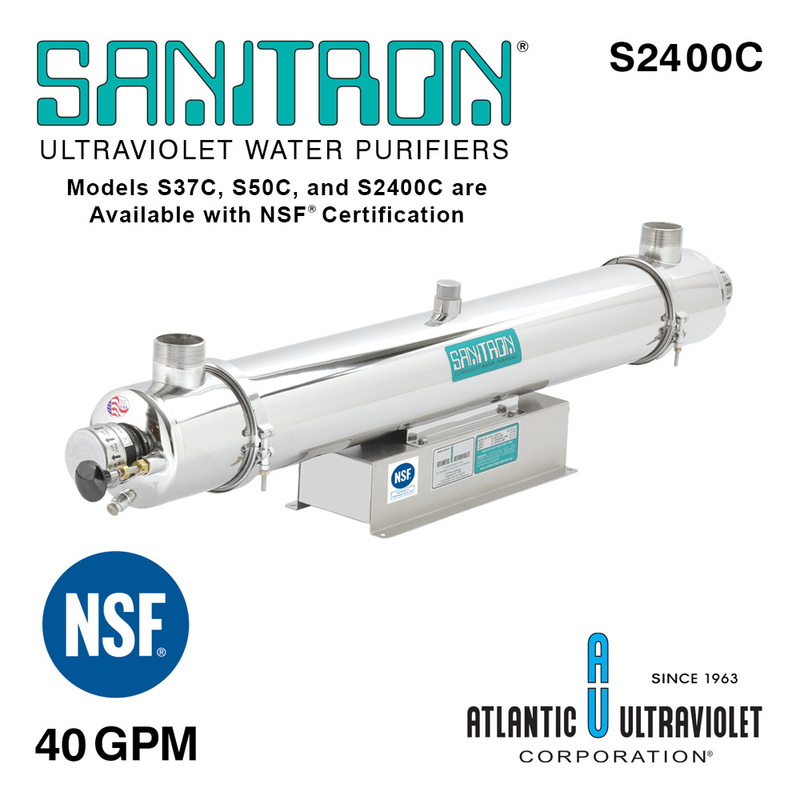 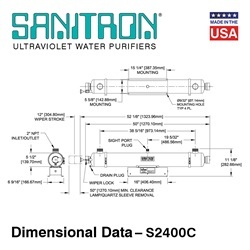 SANITRON® Models S37C, S50C, and S2400C are NSF/ANSI 61 & 372 Certified. For more UV instructional videos, click here! 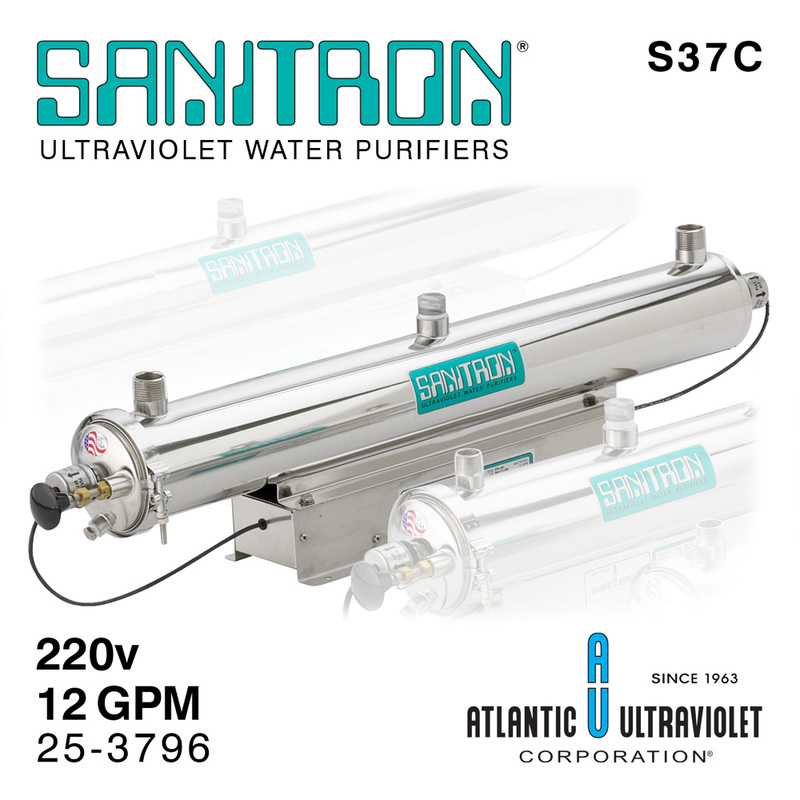 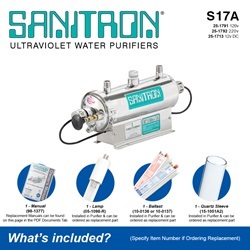 The unique advantage of the UV method of sterilization of water is that nothing is added to the water. 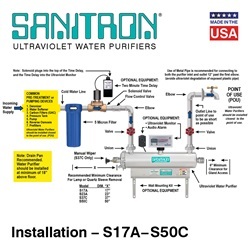 When chemical methods of treatment are used there may be handling problems, taste and odor problems, and undesirable chemical reactions with substances present in the water. This difference is most significant when producing water for drinking or swimming, processing foods and bottled beverages, manufacturing cosmetics or pharmaceuticals, use in hospitals and research institutions, and tertiary treatment of municipal or industrial wastewater. UV Water Purifier Monitoring Options: Guardian™ Ultraviolet Monitors, STERALERT™ Lamp Status Alarm, and SENTRY™ Safety Sensor. 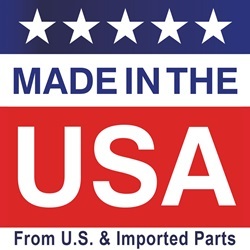 120 3 3/4" NPT 18W 8.1875" 19.375" 4.3125"
230 3 3/4" NPT 18W 8.1875" 19.375" 4.3125"
12vDC 3 3/4" NPT 18W 8.1875" 19.375" 4.3125"
120 6 3/4" NPT 25W 8.1875" 25.375" 4.3125"
220 6 3/4" NPT 25W 8.1875" 25.375" 4.3125"
12vDC 6 3/4" NPT 25W 8.1875" 25.375" 4.3125"
24vDC 6 3/4" NPT 25W 8.1875" 25.375" 4.3125"
120 12 1" NPT 48W 9.5" 39.375" 5.6875"
220 12 1" NPT 48W 9.5" 39.375" 5.6875"
230 12 1" NPT 48W 9.5" 39.375" 5.6875"
12vDC 12 1" NPT 48W 9.5" 39.375" 5.6875"
24vDC 12 1" NPT 48W 9.5" 39.375" 5.6875"
120 20 1-1/2" NPT 65W 9.5" 52.375" 5.6875"
230 20 1-1/2" NPT 65W 9.5" 52.375" 5.6875"
120 40 2" NPT 140W 11.125" 52.375" 6.625"
230 40 2" NPT 140W 11.125" 52.375" 6.625"
120 40 2" Tri Clamp 140W 12.1875" 50" 6.625"
120 40 2" Tri Clamp 140W 12.1875" 52.375" 6.625"
220 40 2" Tri Clamp 140W 12.1875" 50" 6.625"